Audi caused an absolute sensation when it launched the original TT back in 1998. While this second generation car has lost some of the original’s dramatic looks, it’s still a stunning looking car in either coupé or Roadster forms. Bigger, and hence slightly more practical, the newer TT really is a car you can use every day, though naturally the coupé offers less compromises than the open-topped Roadster. A wide range of engines and transmissions gives used buyers great choice, but the TDI is the best all-rounder. 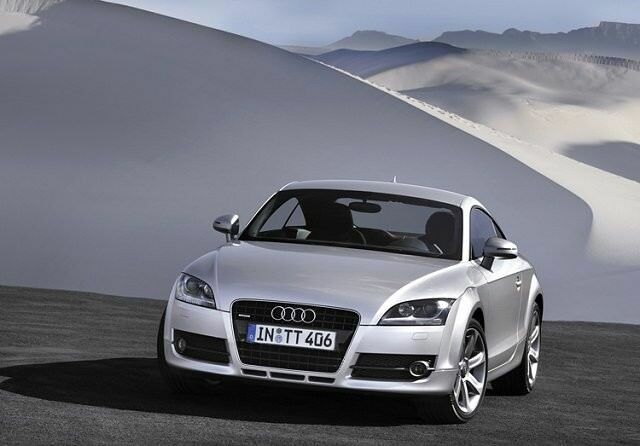 The Audi TT is offered in either coupé or Roadster guises. The coupé benefits from a pair of tiny, useless for sitting in, rear seats while the Roadster is a pure two-seater. The boot is also smaller and less practical on the Roadster thanks to the folding mechanism of the roof - the coupé is a hatchback. Both look and feel great inside and out the fit and finish is up to Audi’s usual high standards. The range spans a wide price spectrum, so the entry-level 1.8 TFSI petrol engines with manual transmissions and front-wheel drive are relatively affordable. At the other end of the scale are the TT S and TT RS models, the later competing on performance and pricing with cars like the Porsche Boxster. Quattro four-wheel drive is standard on high-performance versions, while entry-level cars are front-wheel drive. Equipment varies with engine choice, but even entry-level cars feature air conditioning and alloy wheels. S line trim sharpens up the looks further. Automatics are available optionally, called S tronic. The most sensible, and rounded in regards to performance and economy, is the TDI diesel version, which uses 5.5 litres/100km combined and emits just 139g/km of CO2. Turbocharged petrol engines might be faster, but the punchy 2.0-litre TDI version with quattro four-wheel drive is a difficult package to fault. It’s quick, economical and just as fun to drive as the other models. You can choose between manual or automatic depending on preference, but the auto does slightly increase CO2 emissions and dents fuel economy. The coupé’s the better all-rounder thanks to a bigger boot and its rear seats, but the Roadster is fun. Audi’s TT remains a head-turning car despite this second generation model losing some of the original model’s quirky style. It’s surprisingly useable as a daily proposition though, with a decent sized boot (in the coupé at least) and relatively affordable running costs. It's a difficult package to fault, even if BMW and Mercedes-Benz rivals are a bit more fun to drive.